It's been a while since our last blog post, so here's the catch-up. We moved back to North America in August 2009 to go back to school for our education degrees. Since we were accepted to the University of Maine at Presque Isle, that's where we ended up living, but only until May 2010. We the moved to Yarmouth, NS, where AC has been madly developing real estate, and I've been (unsuccessfully) looking for a teaching job. The market is tough for teachers here, but I'm on the sub list, so hopefully something will come my way soon. 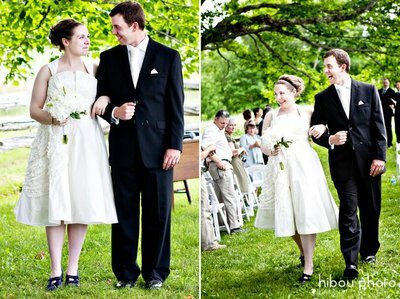 Beyond the professional, we got engaged on Halloween 2010, and then decided to get married in July 2011. Needless to say there wasn't much time to turn a wedding around, and so I put my nose to the wedding grindstone to get the thing planned and organized. We booked a tent, and had the wedding on my family farm in New Brunswick. Could not have asked for better weather. Our photographer (Kandise at hibou photo) captured everything in amazing detail, so I'll direct you to her site for the photos. Also, hire her. She's a rock star. After the wedding weekend extravaganza, we hopped on a plane for the honeymoon. A two day turnaround. Oy. I'm finally getting down to sorting the pictures, and I'll be posting some in the somewhat near future. So stay tuned! Grab the ear, step on the leg and jump. View Winter Vacation 2008/2009 on agc_cwm's travel map. “Grab the ear, step on the leg, and jump” were the instructions our guide gave us before we had to mount the elephant. One of the mahouts, elephant drivers, even demonstrated for us. It looking deceivingly simple. The first step was to kick the elephants leg and say song. Then the elephant would raise its leg so you could use it as a step. After the elephant’s leg was up, that’s when you followed the previous instructions. The steps seem simple until you’ve jumped and you’re holding onto the elephant’s ear with your right hand, and the elephant’s back with your left hand, and you’re not quite up on the back of the elephant and not standing on its leg anymore. Oh, and then it puts its leg down. At this point your only option is to fall off the elephant or scramble up onto the elephant. Thankfully I managed to scramble up on to the back of the elephant. I felt proud to have successfully mounted an elephant. This is Court on the elephant, but I made it up too. Mounting the elephant wasn’t the first thing we did on our elephant expedition today; it was actually the third. First thing we were picked up by a tuk-tuk at our hotel and drove six kilometers out of town to the Elephant Village Sanctuary and Resort. This resort was started up by a German man to start to use elephants in tourism, instead of dangerous industries or industries were they were abused. Currently they have seven elephants at the resort. Most of them worked in the logging industry before they were forced into retirement by age or injury. The first elephant we rode fell into a pile of logs and lost sight in its right eye. Another elephant was previously given amphetamines so it could work longer and harder. 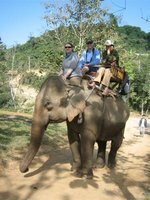 When we first arrived we all got set up with an elephant and mahout and went on an elephant ride around the area. We were able to board the elephant using the tower; this was a lot easier than the aforementioned method. We went through the forest, down the bank and into the river. For all those who are wondering, yes elephant poop does float. Anyways, along the way our mahout switched positions with me and I got to sit on the neck of the elephant and try to control it. Even though we were moving slow you could still feel the strength and power of the elephant. I took a turn driving the elephant, although I wasn’t really driving: our mahout still yelled the commands. Then Court took a turn driving and brought us back to the center. On our way back from the tour, Court had the elephant lined up for us to disembark but at the last minute the elephant decided it didn’t like that plan. It backed away from the tower and circled around so we had to get off from its left side, not its right side. Once we disembarked it was time to reward our elephant with BANANAS! You just put the banana, peel and all, into its mouth. It would take three or four bananas into its mouth before it would stop and chew. After feeding time we had a briefing with our guide, who was also the vet. He told us about the mission statement of the center, where some of the elephants came from, and some basic elephant riding procedures. Everyone in the group decided the most important command for us to remember was the command that makes the elephant stop. Once we had some knowledge of elephant commands it was time to practice them. This is when we got the chance to practice mounting the elephants and walk around a little bit. All six of us in our group took a turn getting on to the elephant and strolling around a bit. After lunch was our last activity with the elephants: bath time. 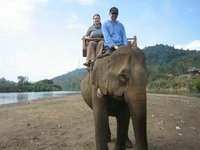 Everyone in our group were paired up with an elephant and mahout. We had to again get on to our elephants. Court’s elephant, Mae San, was nice enough to kneel down for her. That was a lot easier than stepping on its leg and climbing up. Once we were all up on the elephants we started off on the path for the river. We had to drive our elephants the best that we could in single file. Mind you my elephant, Mae Kham tried to pass the elephant in front of me but wisely decided not to when the path narrowed. Just before the river there was an extremely steep but short bank. To navigate down this bank the elephants had to kneel on their hind legs and step down in to the river. It was a highly dexterous move for such a large animal. After this slick maneuvering by the elephant we were in the river. The plan was to walk out into the river deep enough so most of the elephant was wet, splash water on its head, and then scrub it. This worked with my elephant, but not Courtney’s. After a few steps, the elephant filled its trunk with water and sprayed it over its back and whatever happened to be back there, which included Courtney. Then, about ten metres into the river Court’s elephant decided it wanted to sit down, and it did. Court and her mahout got soaked but I think the elephant was happy. Eventually you heard laughter from everyone in our group as each elephant lowered itself in the water. This was the most exciting activity of the day: being able to scrub and clean an elephant in a river in Laos was unreal. What an experience. Once they were cleaned off, and we were sufficiently wet with muddy water, we exited the river on the opposite bank and promptly stamped through some mud. They’re elephants: they can’t stay clean that long! 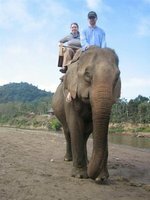 The elephants give rides from 10:00 to about 3:00 and then have the afternoon and evenings off. The mahouts walk them further into the jungle where they let them roam until the next morning when they start their work again for their pay of one tonne of food and lots of bananas. Once we dismounted our rides we walked back out to the river and caught our boat to Tad Sae waterfall. I was expecting a tall single waterfall but the one we came upon was a series of small pools and small waterfalls. The water was clear, blue and frigid; everyone except Court went in for a swim. It was frigid, George Costanza frigid. However, it was refreshing cool and it was a chance to get the elephant dirt/smell off of us. After the rejuvenating dip we hung out by the water, drying and relaxing for an hour or so. When we got in the boat to make our way back to the camp we tried to leave but we were stuck. Our boatman tried to push us away from the dock but we weren’t going anywhere. Nowhere at all. We were stuck on a rock. Me and the other guy in the back had to get out of the boat. Once we were out the boat guy managed to push the boat over the rock, almost capsizing it, then we got back in and we were off. We arrived back at the camp and hopped a tuk-tuk back to town. We chatted with our other group members, two Aussies who were teaching at an international school in Sri Lanka and a mother and daughter from Australia, until we were dropped off at our hotel. We relaxed for a while, watched a crappy made-for-TV movie that was on, showered and then made our way out for dinner and dessert. Now we are back getting ready to pack for our flight back to Bangkok tomorrow.